I plan to release a music video for one of the song’s off the next album but haven’t decided which yet. I try not to force these decisions and just allow the universe to tell me. I like to play very weird instruments and have a rather unique sound. Between my 6 string banjo, my 3 and 4 string slide cigar box guitars, the different electric guitars i use. I’m a big tone junkie and I like writing songs for an audience that’s never heard me but they can sing along either way even if it’s their first time seeing me. I really love Big Wreck, The Living End, and Beck. Jeff Lynne from ELO is always a major influence because I love his chords and catchy melodies. Radiohead will always be a staple and there’s so many more to mention but those are the biggies. Coffee. Lol, I’m just kidding, not really though. I guess my beautiful girlfriend helps me out of bed or pushes me I should say. The fact I’m writing and recording my new album is a major excitement factor. And the fact my Las Vegas show is moving to a much larger venue on the strip in January, I’m also very excited about that. The Bronx Wanderers are doing a two week Florida tour the first two weeks of January, every show is already sold out so I’m looking forward to traveling (a little) again. Before that, my girlfriend and I are going to Disney World for two days so that’s going to be a lot of fun! Thanks for an awesome interview, Vincent! KKLZ's "Open For Bon Jovi" contest winner, Vin A, is in studio talking to M&C about what it was like to open for the future Hall of Fame rocker! Maybe a stack of Saturday night parties in Las Vegas, hosted by Bon Jovi in a fancy Strip theater. Bon Jovi rocked it at T-Mobile on Saturday, filling the place and reminding us why the band is about to be inducted into the Rock and Roll Hall of Fame in April (with Howard Stern making the induction speech). Very clearly they should be on the hot list for an extended engagement on the Strip, joining such contemporaries as Journey, Motley Crue, Guns N’ Roses, Scorpions, Def Leppard, Styx with Don Felder, Billy Idol, Joe Walsh, and ZZ Top to play bursts of shows in VegasVille. Those bands, over the years, have found a sweet spot performing on select nights on the Strip. But Bon Jovi has no plans to jump in. Not yet, at least. Bon Jovi made those comments at a comparatively quiet affair, a launch event for Diving Into Hampton Water Rose at Cleveland Clinic Lou Ruvo Center for Brain Health. The rose is distributed by Southern Glazer’s Wine & Spirits of Nevada, where Ruvo Center founder Larry Ruvo and his sidekick Michael Severino serve as executives. The wine is a partnership between Bon Jovi’s son Jesse Bongiovi and his friend and business partner, Ali Thomas. Bon Jovi is also part of the Cleveland Clinic’s Keep Memory Alive organization and has performed at the Power of Love gala at MGM Grand Garden Arena. Bon Jovi grinned when I asked of the opportunity he presented Vinny “Vin A.” Adinolfi of Bally’s family act The Bronx Wanderers on Saturday night. The rising rocker won a competition co-promoted by the band and KKLZ-FM in Las Vegas to open Saturday’s show. Bon Jovi always gives local bands a shot to take the stage during the band’s frequent U.S. tours. 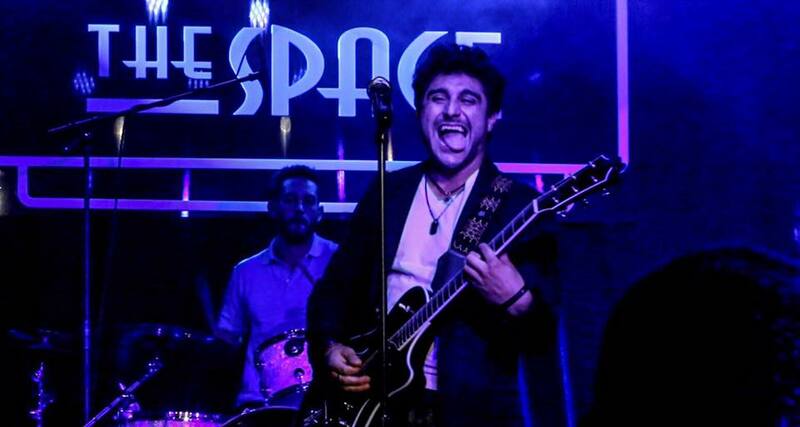 Yessir, Vin A. and the band hit The Space, closing that show at 12:30 a.m.
John Katsilometes’ column runs daily in the A section. Contact him at jkatsilometes@reviewjournal.com.Follow @johnnykats on Twitter, @JohnnyKats1 on Instagram. Saturday was such a fun night of great people and awesome music!!! 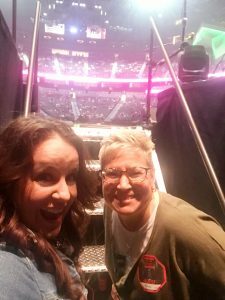 Bon Jovi rocked the house at T-Mobile Arena, with local musician Vin A opening. Carla Rea and Wendy Rush had the honor of introducing Vin A, who won the opportunity to open for Bon Jovi after winning the majority of votes in the KKLZ "Opening Band" contest. It was such a pleasure to hang out with these guys in the dressing room. All very down to earth and humble and SO excited to play at T-Mobile (of course, they had just met Jon Bon Jovi, so that made it even cooler). When it was time, we were all escorted to the big stage! Carla and Wendy MIGHT have been more excited than the band. While the KKLZ girls waited for their cue, they snapped some backstage shots of Vin A getting ready to rock! And...caught a glimpse of Bon Jovi's set list. And then...it was time. But first, one more pre-show pep talk. You got this, guys! Rock that arena!! And rock, they did! Amazing job guys!! What an amazing opportunity for these guys. And well-deserved! Evan interviews Vin A from the Vegas show The Bronx Wanderers. Vin is also in his own solo band and thanks to a lot of determination and a little help from his friends, he won a local radio contest and is now opening for BON JOVI on Saturday, March 17 at The T-Mobile Arena in Las Vegas. How did he finish at the top? What is he planning for Saturday? And what can we expect from Vin A after the Bon Jovi show? All those questions will be answered plus hear Evan’s wife Kelly Meyersfield make a cameo appearance so she can go into full Bronx Wanderers fangirl mode. May have been awkward. 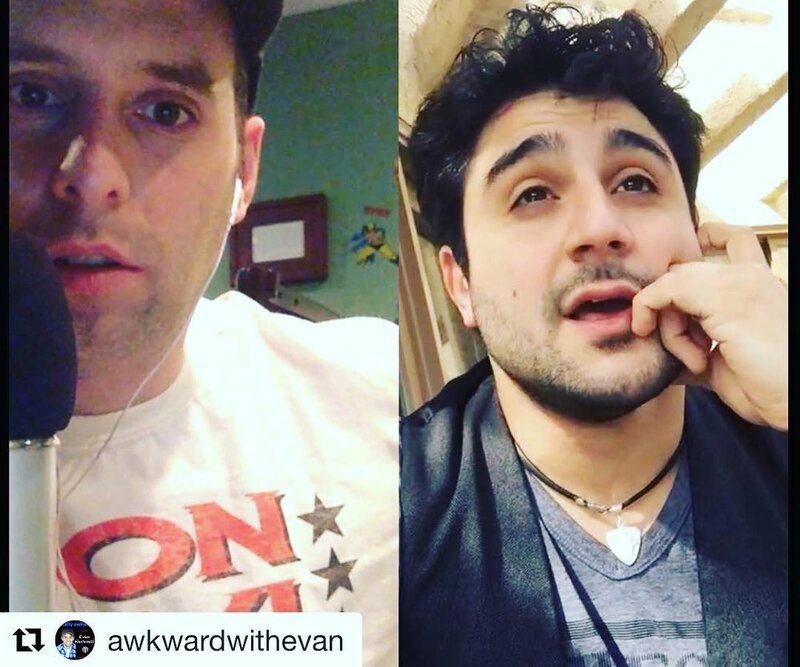 SUBSCRIBE to SOCIALLY AWKWARD, and support the podcast for as little as $1/month by going to patreon.com/funnyevan. Catch The Bronx Wanderers live nightly in Las Vegas at Bally’s and get their albums “Echoes of the Past” and “Not Afraid to Dream” on Amazon. Vinny “Vin A.” Adinolfi is seeing a dream come true when he opens for Bon Jovi on Saturday night at T-Mobile Arena.He’s also releasing his gun-safety anthem “Enough is Enough,” which is to be played at the march on Washington being organized by students in Parkland, Fla. on March 24 Vin A. and the family act Bronx Wanderers continue to rock it out nightly at 6 o’clock at Bally’s Windows showroom. It takes a lot to roust Vinny “Vin A.” Adinolfi III out of bed at 7 a.m., but he popped awake this morning for an announcement by Mike O’Brian and Carla Rea on KKLZ 96.3-FM. 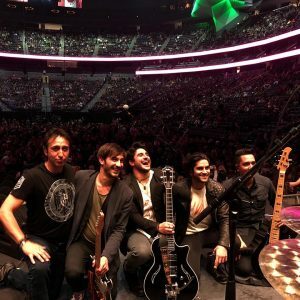 The co-hosts informed their listening audience who has won the station’s battle-of-the-bands contest to open for Bon Jovi on Saturday at T-Mobile Arena. Vin A., a member of the family rock act Bronx Wanderers at Windows Showroom at Bally’s, won the station’s open voting competition. Upon hearing the news, the ever-zealous showman couldn’t get back to sleep. He has fans to thank, a set list to compile. Oh, and rehearsals. Lots of rehearsal time for this one. A guy who is born to perform, Vin A. has been busy outside his regular role as multi-instrumentalist and singer in Bronx Wanderers, founded by his father, Vinny Adinolfi Jr., and featuring brother Nicky Adinolfi. Most prominently, Vin A.’s “Enough Is Enough” anti-gun anthem is due for release next week. The video for that tune, unveiled in December at Myron’s Cabaret Jazz at The Composers Showcase, has been sent to students in Parkland, Fla., who plan to play it during the March For Our Lives event in Washington D.C., on March 24. The march is headed up by students at Marjory Stoneman Douglas High School, site of the Feb. 14 mass shooting that claimed the lives of 17 students and staff. But “Enough Is Enough” won’t be part of Vin A.’s five-song set Saturday night. Prior to Saturday, Vin A. has opened for one other significant act — the Long Island band Brand New, popular on the East Coast several years ago. Vin A.’s band Lovebent opened at the 5,000-seat theater at his college, Stockton College in Atlantic County, N.J. But opening for Bon Jovi in front of 16,000 or so rock fans is an entirely different dimension. “I am lucky to do it, happy that the fans of Bronx Wanderers responded the way they did,” Vin A. said. He added that he plans to continue performing nightly with the family act, still chugging along after opening at Windows Showroom in October 2016. 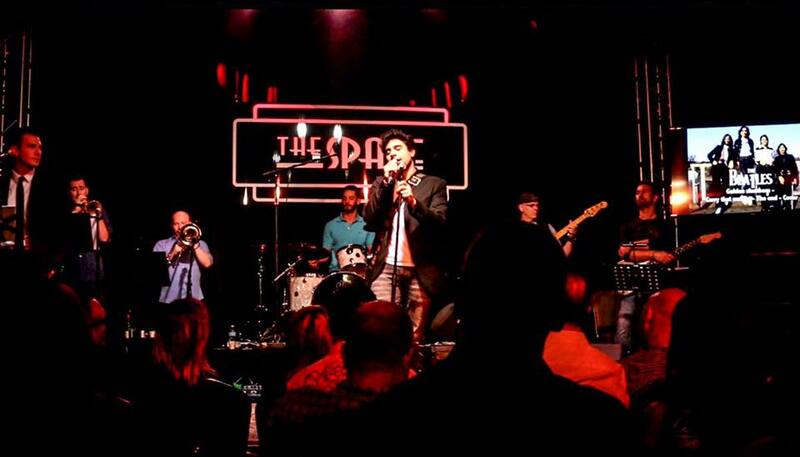 On April 17th, people across the Las Vegas valley come to "The Space" to support local charities by putting on a show called "Mondays Dark." It's the best $20 you can spend on entertainment and it goes to charity! This week is the "Peoples Autism Foundation." This night is special because it's BEATLES NIGHT!! Performers were asked to pick some of their favorite Beatles songs to perform. Every month, Mark Shunock partners with a different local Las Vegas charity. He gathers an eclectic cast of guests including stars from Hollywood, the Strip, musical acts, athletes and celebrity chefs for 90 minutes of chat, entertainment - and a lot of laughs. There is always a silent auction with amazing finds and tons of great drink specials. Vin A. especially killed the end of the show with his version of "Golden Slumbers/ Carry That Weight/ The End." Once the song came to an end, the audience roared and were quick to stand on their feet. You can catch the video here! Don't miss out on the next Mondays Dark supporting The Cupcake Girls on May 1st! Since 2013, Mondays Dark has partnered with over 30 local charities. It's mission is to raise 10k in 90 minutes. The $20 variety show has become one of the hottest tickets in town and the list of charities waiting to partner with Mondays Dark continues to grow. Mondays Dark has raised over $350,000 and every penny has stayed here in Las Vegas with each of it's featured charities. Tickets are $20 and VIP is $50! Tickets are available now, and going fast! Call 702-478-2899 to purchase or just click here. Oh my goodness! The Paul Lynde Show is now officially open inside the Windows Showroom at Bally’s Las Vegas (Photo credit: Denise Truscello /WireImage). Written and performed by comedian and acclaimed celebrity impersonator, Michael Airington, the show opened to enthusiastic reviews from audience members attending the red carpet grand opening of the show on Saturday, April 8 celebrating the life of the legendary comedian, Paul Lynde. The one-man Paul Lynde Show is based on the comedian’s 1976 live theater production of the same name and features voiceovers from the Master of The Hollywood Squares himself, Peter Marshall, as well as an all-star three-man band comprised of acclaimed musical director Keith Thompson and Bronx Wanderers stars Vinny Adinolfi and Fernando Torte. His looks—close enough. Airington’s transformation into Lynde for each show takes an hour to complete and includes full hair and makeup. His mannerisms and gestures–flawless. His voice. One would think that the nasally, campy, snarky, incomparable voice of Paul Lynde could ever be duplicated–or want to be, but Airington masters Lynde. The voice of Peter Marshall is real; Peter recorded the track for the Hollywood Squares segments for Michael. Close your eyes for a moment and listen to the dialog between Peter and Paul. You would swear it was 1978 again. Michael has spent years performing and perfecting this character and caricature of Paul. Many of Paul Lynde’s friends have helped Airington perfect the character, including Peter Marshall, Cloris Leachman, Kaye Ballard, Karen Valentine, Jan Forbes and the late Andy Williams. This isn’t a tribute show–the Paul Lynde Show is produced with the full approval and cooperation of the Paul Lynde estate. The show incorporates as much variety as Lynde. Airington’s monologs, singing, and dancing are entertaining enough, but the history and comedy that was Lynde and Lynde’s life are joyfully recounted and will have you hopping back on YouTube for Hollywood Squares clips and Hulu for Bewitched re-runs. If you find yourself in a conversation with Michael and are interrupted by his phone, you, too, will be downloading Samantha’s tinkle-tinkle-tinkle ringtone. There was no denying Paul Lynde was gay, but Lynde never publicly came out. With so many actors fearful of what coming out would do to their careers, Lynde seemed fearless. While it wasn’t something that was discussed, it wasn’t something of much controversy either. Paul Lynde passed away in 1982 at the age of 55 in his home in Beverly Hills. Tickets for The Paul Lynde Show starring Michael Airington are available at Ticketmaster.com and at Bally's Box Office with performances at 2pm Wednesday - Monday at the Windows Theater in Bally's. As Danish storyteller Hans Christian Andersen in the 1952 film, Danny Kaye travelled the countryside delighting children with his musical fairytales. Assuming Kaye’s fictionalized mantle, Bronx Wanderer turned troubadour Vin A strolled the grounds of Las Vegas’ Nellis Air Force Base spinning songs for the children of Air Force personnel in celebration of the Easter Eggs-Travaganza. With an already full schedule that included a day of sound checks and three shows on the Las Vegas Strip (The Paul Lynde Show, The Bronx Wanderers and a private event, UNLVino at Paris Las Vegas), Vin A couldn’t say “no” to the Air Force kids. Eggs-Travanza organizers Jacquie Imhoff and Harris Weinblatt assembled entertainers and dozens of volunteers to stroll the grounds and man “goofy games” for the kids, providing fun, music and prizes for the hundreds who turned out for the event. "It has been a dream come true to get to perform on the Las Vegas Strip over the past six months," said Vinny. "It's been amazing to meet audiences from all over the country and even the world. By the end of each show, people in their 20s into their 80s are all jumping to their feet, clapping and dancing along with us. We have loved every minute of living and performing in Vegas and look forward to being here for many years to come!" Tickets for The Bronx Wanderers are $69.99, $79.99 and $99.99 for VIP seating, which includes a meet and greet with the cast and a photo. Pricing includes all additional fees. Locals can purchase premium seats for $34.50 (additional fees apply) when they mention the code BWLOCAL. Tickets may be purchased online, by calling (702) 777-2782 and (855) 234-7469, or in person at any Las Vegas Caesars Entertainment Box Office. For groups of 10 or more call 1-866-574-3851 or email EntertainmentGroupSales@Caesars.com. The Bronx Wanderers are definitely some angels in the outfield! Yo' Vinny and Vinny "The Kid" are frequent BUDDY volunteers at the games. Miracle League provides children and adults with cognitive and/or physical challenges in the greater Las Vegas community the opportunity to play baseball in a safe and nurturing environment. A half decade ago, musician/singer/composer/arranger and all around talented nice guy Kenny Davidsen packed up his piano, checked out of his Manhattan apartment and headed to Las Vegas. Never passing up an opportunity to be seen, Davidsen quickly became a familiar face around town sitting in with some of the best and developing a loyal following in the process. Davidsen and his trademark bowtie soon established residency gigs at Downtown Las Vegas hip nightspot Don’t Tell Mama after having served an identical residency at New York’s Don’t Tell Mama. Before long, local favorite Tuscany Casino teamed up with Davidsen for a weekly show that’s become a favorite of many of the town’s most well known performers. Davidsen, a graduate of Stuyvesant High School (for you Bronx Wanderer fans) now hosts Tuscany’s weekly Bow Tie Cabaret every Friday at 8:30 and other special shows in the casino’s Copa Room. Friday it was newcomer Vin A’s turn to share the Bow Tie Spotlight with some of his more contemporary favorites. Heeding Papa Vinny’s advice, played some of the “way-back” songs from the Beatle’s era. "Success in Las Vegas comes from hard work." The Bronx Wanders, who appear 7 nights a week, are out there making guest appearance and getting their names known and faces recognized, developing a local following as they did with their East Coast and Midwest tours. The responses from Las Vegas locals have been overwhelming. There’s life off The Strip in Las Vegas but it’s a life that’s not found in the visitor’s guides that stockpile the end tables in casino guest rooms. For some of the treasures, it takes a little digging to unearth those buried treasures. One of those riches is Composer’s Showcase, a little known gem of a show that only about 260 people are privileged to attend every month or so. Usually on the second Wednesday of the month, after 10:00 PM when the curtains for most performances on The Strip have dropped their curtain, the musicians, performers, backstage crews and others gather at Las Vegas’ Smith Center for the Performing Arts. The nearly four year old gleaming art deco complex boasts three theaters: the 2000 seat Reynolds Hall for booming Broadway shows and concerts, the intimate Troesch Studio theater rehearsal hall for “black box type” smaller shows and, what many consider it’s crown jewel, the 258 seat Cabaret Jazz with perhaps the finest sound system and engineers in The World. "Vin A held his own and then some with the elite inner circle audience of respected Las Vegas show people drawing a standing ovation for his work." 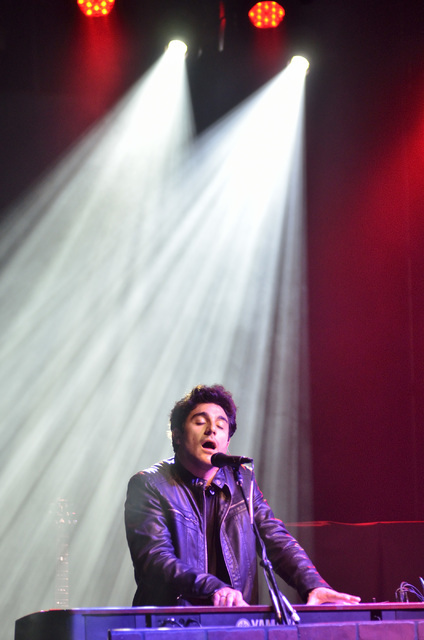 The Bronx Wanderers Vin A took his place on the Composer’s Showcase stage Wednesday evening with one of his original compositions, true to the rules of the showcase that only allow for previously unrecorded works. On an evening that saw many tributes to Christmas, love, broken hearts and a variety of parodies, Vin A held his own and then some with the elite inner circle audience of respected Las Vegas show people drawing a standing ovation for his work. Strictly presented for the love of the art, Composer’s Showcase is a “giveback” event where performers are paid in the form of applause, love and affection by their fellow industry folk. Volunteering to accompany Vin A were musicians on cello, violin and a 4-piece horn section and Bronx Wanderers band members Joe Bonasorte (guitar), Nicky Adolfini (drums) and Fernando Tort (bass). On Thursday April 23rd, the normally reserved Lakeside Lodge was rocking as the trio known as Lovebent rook to the stage. In a set that included some classic covers and creative originals, Lovebent proved they were ready for the big time. In promotion of their debut album Surface Junk, Lovebent played “Sunday Morning,” an original, guitar driven tune that serves almost as an instant adrenaline rush to its listeners. Indeed, it was the song that had the audience on their feet. Lead singer and guitarist, Vin Adinolfi invited some enthusiastic fans onstage to sing back-ground vocals. It became glaringly obvious that Lovebent was going to make a dent in the musical world, and top 40 radio. It makes one wonder why their album only has a tentative December release. In between these original treats were covers of such bands as Aerosmith, Van Halen and Weezer and the song “Jumpin Jack Flash.” These selections only prove that the members of Lovebent have the musical background and knowledge to craft their own sound. There’s no question why he is the bands front man. He and his other band members look so at home and comfortable on stage that one almost forgets they are watching a rock show. Instead It’s like witnessing some friends who just love music. Many of the fans who showed up to the show felt this connection, shouting their praises every chance they got. The night turned serious when Adinolfi had a moment of rememberance for the late Stockton professor Paul Lyons, saying how he was, “the coolest teacher ever.” Lyons passed away a few months back and harbored a passion for music just like Adinolfi himself. Lovebent put on an enjoyable and entertaining concert experience, a polished act that is really for venues far bigger than claustrophobic Lakeside Lodges. For more information on The Bronx Wanderers, visit www.thebronxwanderers.com.